Inner Diameter: 8mm / 0.31"
Outer Diameter: 22mm / 0.86"
These miniature bearing are made of high quality steel and ceramic for low noise and long service life. Bearing with ceramic balls is better resistant to corrosion and rarely require lubrication. 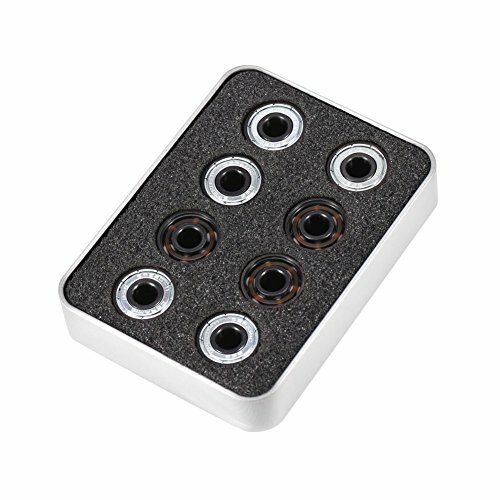 There comes total 16 pieces miniature bearings, which has a 8mm inner diameter, a 22mm outer diameter and a 7mm thickness. These 608 bearing are specially designed for inline roller skate, skateboards and scooters to improve speed. The lighter balls allow the bearing to spin faster, and uses less energy to maintain its speed.